How many ways to cook pumpkin and squashes? The ways of cooking and the recipes are endless. My favourite is to roast these beauties. 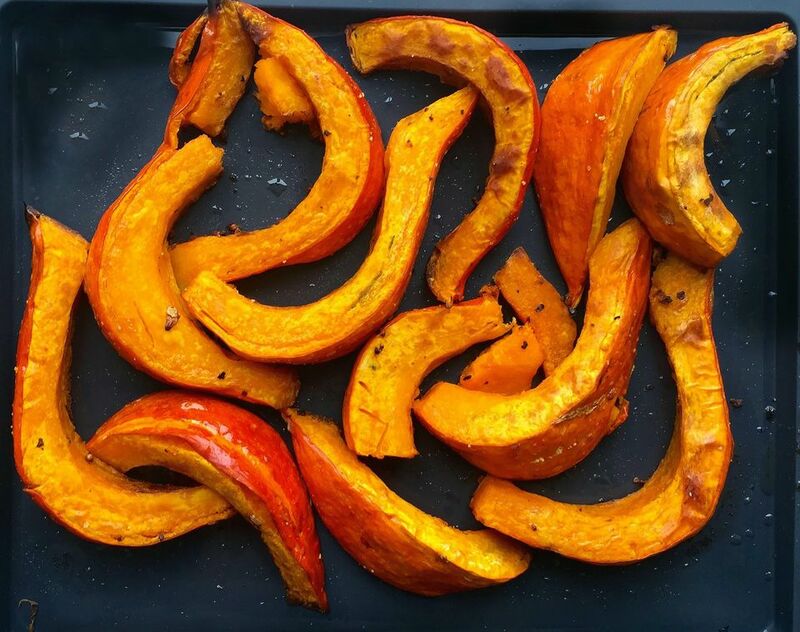 Whether it is a flaming orange, autumn pumpkin, sweet yellow butternut, button-sized Potirons or beautiful, knobbly Turks Head when it comes to cooking, I like them roasted. The oven-cooking intensifies both the flavour and colour whilst softening, the sometimes rock hard flesh. There are some types, like the Potimarron (Red Kuri) pumpkin where it is even possible to eat the flesh, making for an even more interesting dish. The picture in this recipes shows the roasted Red Kuri squash but you choose your favourite. The recipe is the same for all, though the cooking time may take longer if it is a hard variety. The roasted pumpkin can be eaten simply, straight from the oven as a side vegetable, or use the cooked pumpkin in your favourite recipes or any time a recipe calls for cooked pumpkin. Carefully wash the pumpkin or squash and dry thoroughly. Using a long, sharp knife carefully cut the pumpkin or squash into wedges or slices depending on the shape. Be careful when cutting as the pumpkin can easily slip, to make it easier put it onto a damp tea towel to help prevent it from slipping. Lay the wedges on to a large, roomy baking tray. The slices must be one layer and not overlapping. If you have more slices than can fit in one layer, then use two or more trays. Generously season with sea salt and black pepper. Sprinkle the mace, paprika and the thyme evenly over the wedges. Pour over the oil then roll the slices or wedges in the oil to make sure they are all well covered. Place the tray (s) into the preheated oven. Roast for between 30 and 40 minutes, longer if you the pumpkin needs it. The skin should be slightly blistered and the flesh soft when pierced with a sharp knife. Remove the tray (s) from the oven and leave the pumpkin to cool ever so slightly then serve. If the skin is edible, then leave it on, otherwise remove the skin, it should slip away quite easily. Or, cool the slices completely and use the lovely enhanced flavour in all your favourite recipes. The roasted pumpkin can also be pureed. You can also cook the pumpkin without the paprika and chilli if you wish. The mace, salt and pepper is a must though.